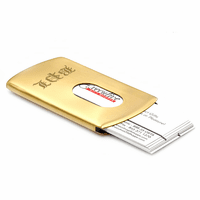 The Chinese therapy ball desktop business card holder is two thoughtful gifts wrapped as one. This desk set includes a pair of stress relieving Chinese therapy balls that are nestled in an arched holder. Moving the Chinese therapy balls in your hand helps to increase blood circulation and relieve stress. 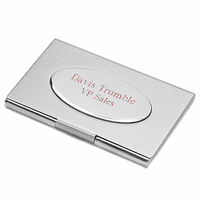 Behind them is a business card holder that holds up to fifteen standard business cards. Add custom laser engraving to the front of the base to make this an even more unique gift. This therapy ball and desk business card holder set comes packaged in a gift box, ready to be given. Dimensions: 4 1/4" x 4 1/4" x 2 1/2"
What is the diameter of the balls? I'm looking for 25 or 30mm ones as I have small hands and will use them for dexterity exercises - the small ones are hard to find. Thanks. Each ball has a diameter of 1.5"
Could you imprint or engrave a company logo instead of text if I supplied the necessary artwork? Yes, we can. 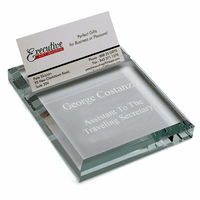 You can email the logo to us at help@executivegiftshoppe.com . If you have it in black and white .eps format,that is ideal but a black and white jpeg works too. Please let me know if you have any questions. 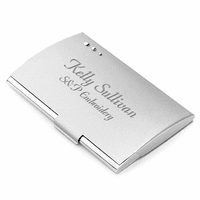 The gift was delivered on time, engraving done as shown on website, good quality and good pricing. Very happy with the whole experience. Will be visiting site again for gifts. This business card holder was so much better than I even hoped. The balls make soothing jingle noise. Super fast shipping too!